Directors – Bibo Bergeron, Vicky Jenson & Rob Letterman, Screenplay – Rob Letterman, Damian Shannon, Mark Swift & Michael J. Wilson, Producers – Bill Damaschke, Janet Healy & Allison Lyon Segan, Music – Hans Zimmer, Music Supervisors – Darren Higman & Laura Wasserman, Visual Effects Supervisor – Doug Cooper, Animation Supervisors – Ken Stuart Duncan, Lionel Gallat, Fabrice Joubert, Fabio Ligini & William Salazar, Production Design – Dan St. Pierre. Production Company – DreamWorks Animation. Oscar is a lowly fish working a nowhere job as a whale cleaner on the Shark Side Reef. He is always coming up with schemes for trying to make it big. The Reef lives in terror of the sharks. However, the lead shark Don Lino’s son Lenny has no appetite for eating other fish and calls himself a vegetarian much to his father’s shame. Don Lino leans on Oscar’s boss Sykes for money and so Sykes demands that Oscar pay up the money he owes him. Oscar’s co-worker Angie secretly loves him and gives him a pearl to pay Sykes but Oscar is instead tempted to put the money on a seahorse race after overhearing a tip. When the horse trips over at the finish line, Sykes has his heavies take Oscar away to be dealt with. They are surprised by Lenny, whose brother Frankie is trying to teach him to be a predator. An anchor then falls and kills Frankie. Afterwards, Oscar is thought to be a shark killer and is proclaimed a hero on the reef. Oscar then finds that this requires him to stand up to further shark attacks. He meets and befriends Lenny, who is in hiding, and shelters him in the city by disguising him as a dolphin. Together the two of them have to confront Don Lino as he heads towards The Reef, seeking revenge. Shark Tale comes from DreamWorks, a company that has been having great success in the field of animation since the late 1990s, in particular with the massively successful Shrek (2001). Shark Tale is co-directed by Vicky Jenson, who also co-directed Shrek, and Bibo Bergeron, who previously co-directed DreamWorks’ The Road to El Dorado (2000) and went onto solo direct A Monster in Paris (2011) in his native France, while Rob Letterman subsequently went onto co-direct DreamWorks’ Monsters vs Aliens (2009) and the live-action Gulliver’s Travels (2010) and Goosebumps (2015). It is impossible to avoid making comparisons between Shark Tale and Pixar’s Finding Nemo (2003), which came out just over a year before Shark Tale. Both are CGI animated films, both feature talking fish and both depict the underwater world with the same vibrant palette of colour. Shark Tale was greeted with a number of Finding Nemo Lite reviews, although this is perhaps unfair to it – the amount of time that animated films spend in production would mean that planning and production of Shark Tale would have been well advanced before Finding Nemo ever appeared in theatres. Shark Tale works enjoyably. It trades in familiar characterisations – the loser who accidentally finds himself acclaimed a hero through his own liberal regard for truth in retelling his exploits only to then be thrust into deep water; the bad girl temptress; the heroine who pines unnoticed for the hero; the opportunistic boss. One fascinating aspect is how each of the animated characters reflects the physical likeness of the actors voicing the part – bad girl fish Lola has Angelina Jolie’s distinctive features (and in fact gives a better performance than the live-action Jolie usually does), while Oscar has Will Smith’s noticeable African-American features and, in particular, Sykes comes with Martin Scorsese’s distinctive beetle brows. 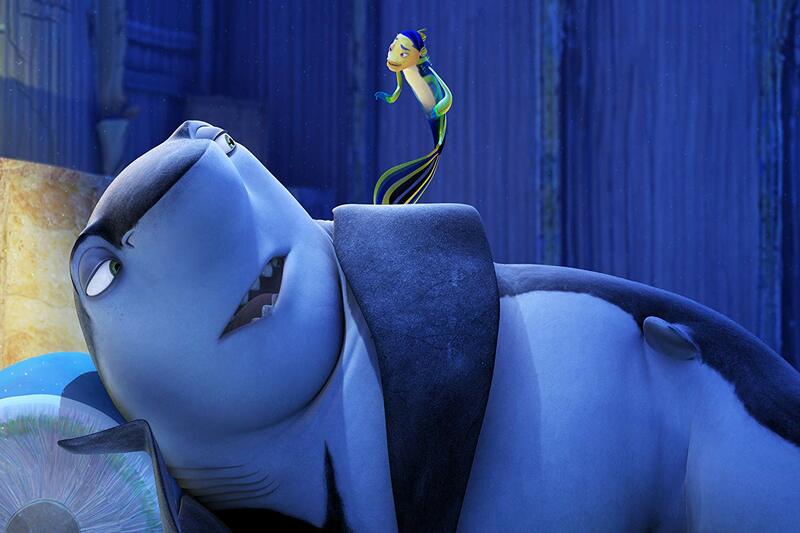 Shark Tale lets its elements come together with effortless ease and enchants considerably. It is not quite up there with Finding Nemo but it works enjoyably. When it came out, Shark Tale was greeted with a number of protests by the Italian-American community over its caricaturing of Italian-Americans as Mafioso. (Although, there does seem something slightly odd about Italian-Americans protesting over their portrayal in a movie about talking fish). If anything, it is less a case of caricature as it is of Shark Tale drawing from in particular the Mafia angst drama of tv’s The Sopranos (1999-2007). The voice cast even includes two Sopranos regulars – Michael Imperioli and Vincent Pastore – while elsewhere, the film casts Robert De Niro and Martin Scorsese, whose mutual influence over cinematic Mafia portrayals is legendary. If any ethnic group had a reason to complain about racial caricatures though, it would surely be Jamaicans, whose caricaturing as Rastafarian jellyfish here borders on bad stock racial types. The other thing that is particularly noticeable about Shark Tale is its product placement or at least its parody of such. This appears to be becoming a standard feature of DreamWorks’ films – a near identical parody of recognisable brand names was conducted in their Shrek 2 (2004) a few months earlier. Here we have piscine parodies of brand names – Gup, Coral Cola and so on. Both Shark Tale and Shrek 2 seem to stand in an uneasy place between whether they are conducting parodies of contemporary commercialisation or whether they are merely using the pretence of this to conduct product placements. It tends uneasily towards the latter one suspects. In that tv watchdogs are getting increasingly uptight about the promotion of brand names on children’s television, the idea of so blatantly slipping such product placement into a children’s film does have an unpleasant whiff to it.